RPC Containers UKSC and Nexus Packaging have collaborated in the design and launch of a new generation of user-friendly large plastic containers that incorporate a totally new and unique anti-glug feature. The Ecostacker plastic drum range has been developed to overcome key ecological, transport, handling and pouring issues that have previously been associated with large containers in order to deliver an unrivalled performance in terms of safety, strength, stability and value. Another important design feature is the innovative head/foot interlocking system which maximises performance during stacking and transport. Filled containers are stacked with the load evenly distributed across eight contact areas to the container beneath ensuring that the integrity, shape and visual presentation of the product is not compromised. The efficient stacking system also reduces transport costs by over 10% compared with existing 20 litre drums and 15% for 25 litre sizes, which helps to minimise companies’ carbon footprints. RPC and Nexus have invested in the latest blow moulding technology which has been installed at RPC’s Plenmeller factory. This technology delivers further sustainable benefits through the use of 3-D material distribution technology to achieve precise drum wall thickness control, top load strength and the most favourable product to packaging weight ratios. 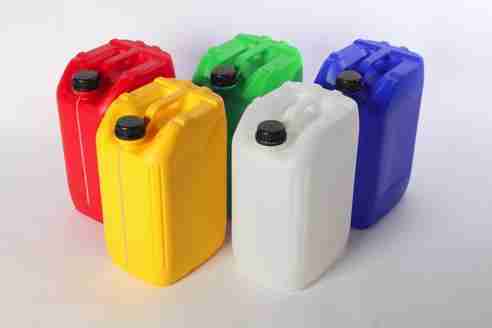 The HDPE containers are 100% recyclable. The Ecostacker range is available in different specifications to meet individual customer and market requirements. Features include fill level graduations and the containers can also be specified with a view strip. They are suitable for food contact as well as UN approved for the transportation of hazardous materials.